60 Years Ago, 2 Boys Met And The Beatles Began On the anniversary of John Lennon and Paul McCartney's first meeting, revisit the church garden party that changed the course of popular music forever. 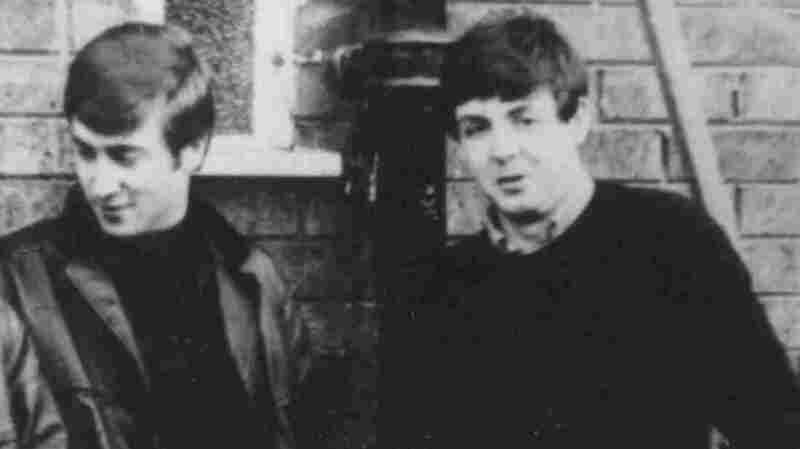 John Lennon (left) and Paul McCartney, pictured here circa 1960, met as teenagers in July 1957. It was July 6, 1957. John Lennon, then 16, was playing with his skiffle group The Quarrymen at a church garden party in the midst of a stultifying heat wave. Paul McCartney, 15, was in the crowd, wearing a white sports jacket with a pink carnation. In the documentary The Beatles Anthology, McCartney remembers the spectacle of Lennon strutting around in a checked shirt, "and sort of blondish kind of hair, little bit curly, [sideburns], looking pretty cool. And he was playing one of these guitars — guaranteed not to crack, not a very good one — but he was making a very good job of it." The Quarrymen performed "Come Go With Me" by The Del-Vikings, and though Lennon clearly didn't know the words, he adapted lyrics from blues songs instead. That ingenuity impressed McCartney, who met Lennon after the set. Backstage, McCartney played Eddie Cochran's "Twenty Flight Rock," which in turn impressed Lennon — perhaps in part because McCartney actually knew all the lyrics. Later, Lennon remembered being uncertain about partnering with such a strong musician, who might challenge his leadership in the group. But that hesitation was short-lived. "I turned around right then on first meeting and said, 'Do you want to join the group?' And I think he said yes the next day," Lennon said, as quoted in The Beatles Anthology. Though they wouldn't take the name The Beatles for another three years, that meeting between two boys on a sweltering summer afternoon kick-started a creative partnership that yielded nearly 200 songs valued at close to a billion dollars. Right now, the 50th anniversaries of The Beatles' most famous albums are arriving in quick succession: Revolver last year, Sgt. Pepper's Lonely Hearts Club Band earlier this year and, in 2020, Let It Be. To think such a storied career all comes back to one moment: that chance encounter one afternoon in a Liverpool church hall.